Babies are perhaps the only being that can be called absolutely adorable without teeth. Sweet gummy grins and laughs are what parents of newborns long for and enjoy over and over again. And then teeth start popping through those gums and parents are just as enamored with that changing smile. However, as a young child’s smile begins to change, it is important to remember that s/he needs to receive oral health care to ensure a healthy smile for years to come. The American Dental Association recommends that all babies visit the dentist once their first teeth have come in, or at least visit the dentist before their first birthday. While the first visit will be relatively short and will involve little treatment, visiting the dentist at a very young age allows children to meet the dentist in a friendly and non-threatening manner. Most dentists will count the number of teeth in the child’s mouth and make a game out of it for fun. There will also be a short exam where the gums will be looked at for any potential problems, the mouth will be examined for any issues, and the existing teeth will be checked for decay. Perhaps the most important part of a young child’s first dental appointment is to educate the parent on the necessary care of young, growing teeth. Proper nutrition, good oral hygiene practices, teething, and other topics will be discussed in order to ensure that your child’s teeth are healthy and developing properly. If your dentist has concerns, they will be addressed and discussed. 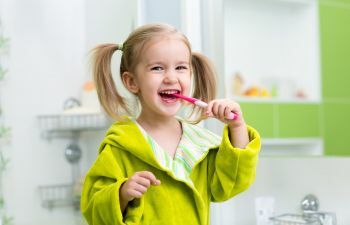 Remember that your dentist is here to promote optimal oral health, so if your dentist discourages putting sweet tea or soda in a bottle, allowing your child to fall asleep while drinking a bottle, or other things – it is only out of the desire for your child to be successful in achieving a healthy, beautiful smile. At Gold Hill Dentistry, we are a family dental practice that truly loves to serve patients of all ages. We are committed to providing high quality dental care in a warm environment and will always keep your and your child’s best interests in mind. Call our dental practice today to schedule your baby’s first dental appointment. We look forward to meeting our newest patient!